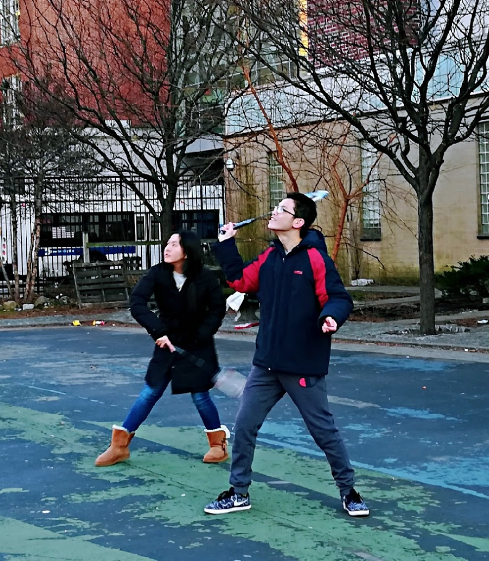 Badminton club members practice in the playground across from Midwood. On a cold windy Tuesday, with the temperature below 30 degrees, brave, badminton-loving Hornets hurried outside, rackets in hand, ready to smash the birdie at their opponent. This is the typical Badminton Club meeting. The club meets on Tuesday, period 10, in the playground across the street, although it gets windy at times. Unlike a sports team, signing up for the club doesn’t require any tryout or skill at badminton. You just need a permission slip signed by your parent and a GO card to receive credit. The club began in October 2018. It consists of many students from different grades and skill levels. Some students have a good grasp of direction, speed, and strength of the birdie, while others have never held racquets and are trying hard to make the birdie fight against the uncontrolled wind for the first time. The club provides more benefits than just receiving credits. The purpose of the club is to try to unite students with this shared athletic interest. The club creates a community for students who are experts in badminton as well as those who want to improve their skills. It also provides a chance to socialize. The club allows students to eventually hold internal friendly competitions. Later on, there may be huge competitions, either in parks or in professional badminton clubs. The purpose is not to put pressure on to students’ extracurricular life, but to try to generate some excitement among members and to change things up after a while. Wu and her teammate Evelyn Velez ’19, who is the club’s treasurer, have experienced challenges from the beginning. When there wasn’t enough equipment to go around, they had to have people take turns, playing short practice games in small groups. “At first, when there weren’t any rackets, some very innovative people used folders as replacements, and they worked quite well,” Velez said. The supervisor of Badminton club, Ms. Natalia Puglisi, now brings plenty of racquets for the students. Wu also encourages the students to bring their own racquets and share with each other. Making a badminton team isn’t really on Midwood’s agenda, especially since it’s the first year of the club. To participate in a PSAL Badminton Team, they need to first find out if Midwood has funding and if enough people are willing to play. In the past, the last badminton club tried to start a team but was set back because of the lack of funds. Club members say that badminton helps players deal with failure and learn the value of small successes. If you’re interested in joining the club, show up at the playground across from Midwood Tuesday period 10, and remember to bring your racket if you have one.